Star Intrigue lets your star-spanning heroes find fame and fortune like never before, forging potent personal brands whose influence spans entire systems and founding factions to further their interests and promote their power across the planets. You'll find rules for characters developing their own personal brands, allowing them to win friends and tip the balance in their favor in social situations based on their charm, acumen, and guile, pulling others into their orbit and setting trends. You'll also find extensive rules for establishing factions in the campaign, from political alliances to religious sects, with power brokers and elites of every kind working to rise up and seize whatever they can hold. These rules can be used to enhance any Starfinder Roleplaying Game campaign, managing verbal duels and debates and building influence within existing organizations and gaining favors as PCs rise to prominence, or risking hazards if they fail their faction bosses for the last time. These faction rules also include options for integrating with the colony and nation-building rules in Star Empires, allowing your heroes to play off their rivals against one another and use their wits to consolidate power and secure their rule from threats that can't be defeated by blasters. Plus, intrigue feats, sample factions, guidelines for adding factions to existing nations, and so much more! 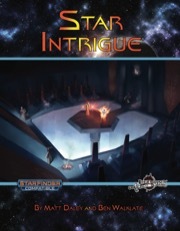 In the great game of interplanetary houses, if you want to survive you need to master the arts of Star Intrigue! Grab this spectacular 44-page supplement by Matt Daley and Ben Walklate today and Make Your Game Legendary! So, love the book and content so far. One question: what the heck are "cp"?!? They're referenced multiple times in regards to Wealth Points. Could the rest of us see the answer to this question? There are supposed to be three messages in this thread before mine but I can only see two of them. Edit: After posting, the post count for this thread is 4, but I only see 3 messages including mine. They say war is just diplomacy by other means. So if intrigue fails, now you can unleash STAR BATTLES! cp refers to Credit Points. It's the currency of Starfinder akin to Gold Pieces in Pathfinder. Color me somewhat confused, then. Star Empires goes out of it's way to say a direct Credit:Build Point conversion doesn't exist. This seems a strange thing to contradict in Star Intrigue. Going along with CP = credits, however, things don't really get any better/clearer. If a Wealth Point = 400 credits, and 10 WP = 1 Build Point, that means that the starting treasury of a Star EMPIRE is a measly 200,000 cr (50 BP). I'm fine with BP & WP being abstractions lacking a conversion from currency. However, Star Intrigue goes out of its way to say factions can "purchase" additional wealth points for 400 cp. That seems ridiculously low. I appreciate the answer, though. It's easily house-ruled to a different value, of course. Question: there was a book advertised for the Aethera Campaign Setting called the Intrigue Manual. Is this where the material originally slated for that publication ended up? This looks like a conversion blip from Ultimate Factions into Star Intrigue. In Pathfinder a BP can be purchased for 4000 gp, and a WP is intentionally 1/10th of that, so 400 gp. Since there’s no really clean gp to credit conversion, it’s really tricky to convert over, but if you’ll take a very unofficial errata, WP should be purchasable for no less than 2,000 credits, and I’d seriously consider putting it up even further. It was a spam post that I flagged and got removed by Paizo, not an answer.